This salad is simply delicious to make with all things “Canadian” eh! Roast walnuts in 350°F oven about 5 min. or until beginning to brown. Fry bacon until crisp, dry on paper towel and crumble into pieces. Slice celery stalk in half lengthwise. Cut the 2 pieces in half and slice on diagonal. Thinly slice apples, skin on. Place salad greens on plates or in bowl. Dress with apples, celery and cheese. 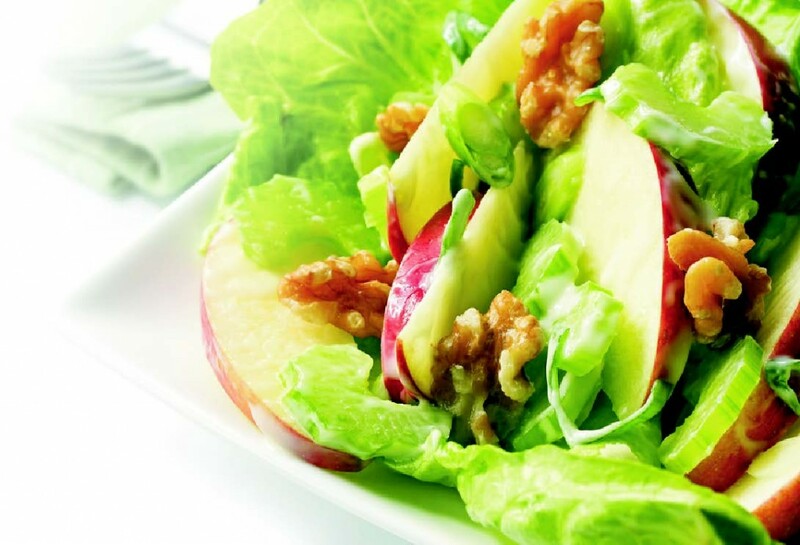 Drizzle with Apple Cider & Garlic Vinaigrette, tossing salad. 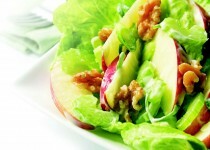 Garnish with toasted walnuts, (walnuts may be seasoned with a sprinkling of cayenne powder while roasting). Assembly Option: This salad can be assembled in metal rings (like a hollowed out tuna tin) for individual servings. Lightly toss your greens first with 1/2 dressing, for stick. Layer your ingredients in a pleasing stack, pressing into the ring to compress the ingredients. At this point, you can wrap and refrigerate until ready to use. Simply invert onto a plate when ready to use and gently push, lifting up the ring to hold the shape. Drizzle with remaining dressing.